One of the biggest barriers to helping those experiencing homelessness off the streets is the lack of affordable housing in San Diego. That is why, for years, Father Joe’s Villages has fostered strong partnerships with compassionate landlords around our great city. Landlords like Betty and Gary Becker, who dedicate their time to helping end homelessness in our community. Landlords Betty and Gary Becker team up with Father Joe’s Villages to house neighbors in need. Here, they pose with Jessica Johnson, Director of Tenant Services, and Jesse Casement, Division Director of Client Services. Betty and Gary Becker first learned about the City of San Diego and Father Joe’s Villages’ targeted efforts to house people experiencing homelessness from an article they read in the San Diego Union-Tribune. At the time, Betty and Gary were in the process of fixing up two units in a property they own. They immediately called us to get more information on the program and were connected with Jessica Johnson, our Director of Tenant Services. In the past two years, both the city and county of San Diego have initiated landlord incentive programs aimed at encouraging property owners to rent to our community’s most vulnerable. The San Diego Housing commission leads the City of San Diego’s effort called the Landlord Engagement and Assistance Program (LEAP), while the County’s program is called the Landlord Incentive Program. Both programs provide landlords with multiple incentives for renting housing units to those in need. They provide landlords with a cash incentive for renting to a person who is homeless and can pay for damages to property if needed. Gary & Betty Becker post with their certificate of appreciation with Deacon Jim Vargas. Father Joe’s Villages participates in both of these programs working closely with the San Diego Housing Commission and the County to qualify individuals and landlords for the programs. In addition to helping landlords qualify for incentives, our Tenant Services team also provides landlords with the assurance that tenants will be taken care of. The team provides tenants with on-going case management services to ensure that tenants in Rapid Rehousing and Permanent Supportive Housing remain stable and successful in their new homes. Betty and Gary decided that working with Father Joe’s Villages would be the perfect fit for them. “Our desire was to help with the homeless population in San Diego, to provide a safe haven for people,” said Betty. They have been partnering with Father Joe’s Villages in their mission to end homelessness for almost a year now and have five tenants renting with them through LEAP. 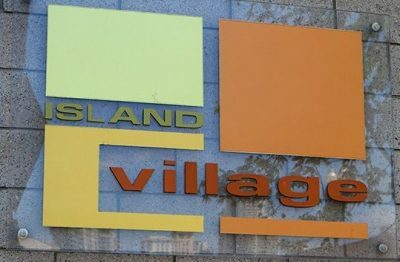 They plan on continuing to rent any units that become available to Father Joe’s Villages clients and urge other landlords to do the same. Father Joe’s Villages does not downplay the importance of landlord participation in the fight to end homelessness in San Diego. At its root, the city’s homelessness crisis is a housing crisis. With such a low vacancy rate, it can seem hopelessly difficult to find affordable housing. By providing even one unit to one of our clients, landlords help the community to prevent and end homelessness. That’s why, each year, we honor landlords for their work with Father Joe’s Villages through our annual Landlord Appreciation Dinner. 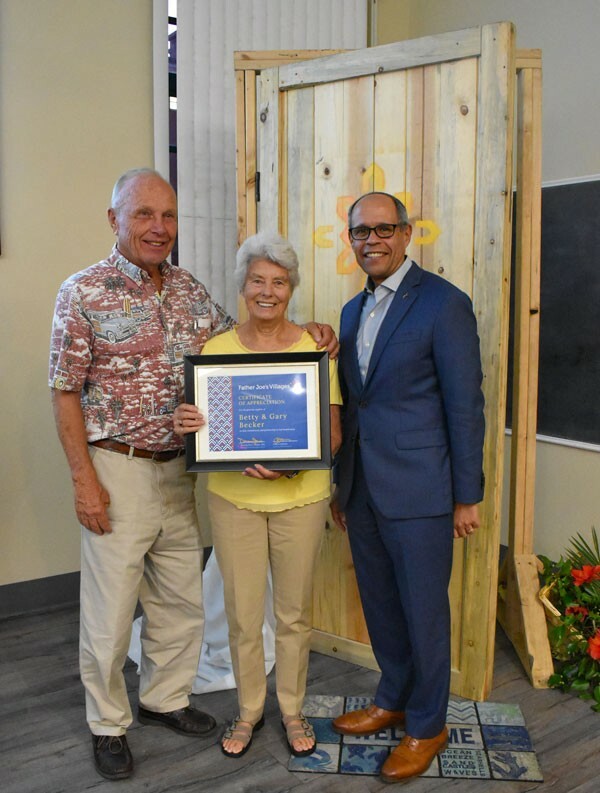 In 2018, the Beckers were presented with a certificate of appreciation for their work. “We appreciate the Becker’s because they care, they enjoy working without housing specialists and making a difference in someone’s life,” says Krystal Andersen, Supervisor of Housing Coordination. 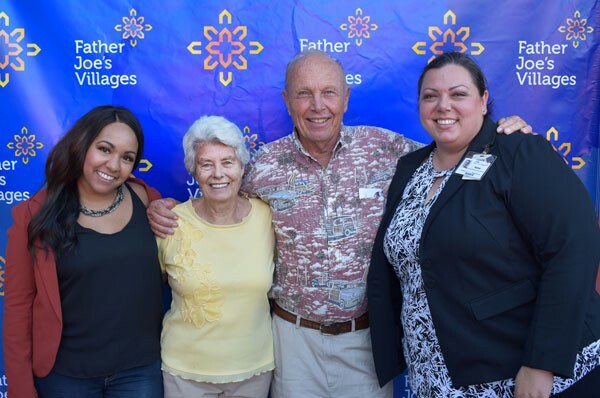 Landlords like AV Rentals, Island Village Apartments and the Beckers are truly helping Father Joe’s Villages end homelessness, one life at a time. “Without landlords, our clients would still be on the streets. With the landlords taking a chance and helping our programs succeed, our clients get a second lease on life,” explains Krystal. If you’re interested in partnering with Father Joe’s Villages to house neighbors in need, please contact FJVHousingPrograms@neighbor.org.